Best Used 4 Wheelers for Beginners. Used 4 Wheelers for Beginners. Which used 4 wheelers are the best for beginning riders? That's a question we hear a lot, so we thought it was about time to get some answers. Since we have access to thousands of ATV owner surveys, we decided that was the best place to find those answers. Owners were asked to rate their ATVs for performance, reliability, quality, and comfort. After several hours of bleary eyed research, some used 4 wheeler models began to emerge as clear favorites. Common traits that make these used ATV 4 wheelers great for beginners are: Low price - easy to ride - easy to maintain - reliable. While there may be other used four wheelers that are just as good, we don't think you can go wrong with any of the ones that made our list. The Honda Recon is a top choice in the utility class. Honda Recon 250 - The Recon has good power at lower speeds and nimble handling on trails. That, combined with lighter weight and a smaller size make it easy to handle for new riders. The simplicity of an air cooled engine and the easy maintenance of sealed brakes and shaft drive make this a great beginner's ATV. And, according to owner surveys, the legendary Honda reliability is once again confirmed with the Recon 250. Basic maintenance keeps it running for years with very little trouble. Kawasaki Bayou 250 - Only ATV in this class with a multi-link rear suspension which offers better ride and handling than the single shock swingarm types. Downside is that it requires more maintenance than the simpler designs. Good power and decent handling but may need better tires for more serious trail riding. Good ATV for work and you can find them at good prices for used ATVs. Suzuki Ozark 250 - Another great example of a simple, reliable, easy to maintain four wheeler for the new rider. We think the Ozark is a little sportier than the Honda with a slight performance edge. You won't find a bunch of gimmicky electronics or foo-foo equipment on these ATVs. You will find everything you need for basic chores and trail riding with a big dose of fun. Much like the Honda, the Ozark is highly rated by it's owners. Good performance and reliability will tend to do that. Another great choice for a beginning rider or just someone that needs a solid ATV at a value price. Yamaha Bruin 250 - Longest wheelbase in the class may make this ATV more comfortable for larger riders. Also has an adjustable rear shock that accommodates a wider range of rider weights. Includes a trailer hitch to give you a head start on those utility chores. An automatic clutch with the 5 speed transmission makes it easy to ride. Shaft drive and air cooled engine keep it easy to maintain. Good for trail riding and plenty of low end power for getting some work done. 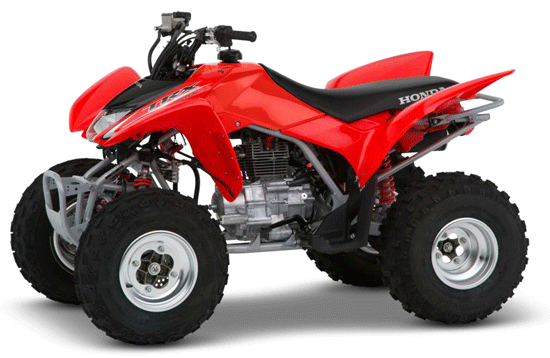 Honda is also a top choice in the sport ATV class. 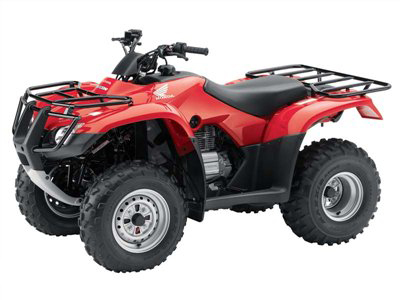 Honda Sport Trax 250 - This sport quad had one of the highest owner satisfaction ratings of any ATV on the market. We think when the folks that spent their hard earned cash recommend an ATV that highly - it speaks volumes about the real value of this great little sport quad. Honda keeps it easy to keep running with a solid air cooled engine, manual shifting transmission with the easy to operate Sport Clutch, and shaft drive. That all adds up to a lot more time riding them than working on them. Which is exactly what makes this used Honda ATV such a great choice for a beginner. Suzuki Quadsport 250 - Like the Honda, the Suzuki is a favorite among owners. It echoes the themes of simplicity and functionality that make it and the Honda great for beginning or smaller riders. It shares a lot of the same running gear with the Ozark 250 but with pure sport quad styling. So you're really getting the strong utility mechanical parts with the style of a sport machine. Air cooled engine, 5 speed manual shifting transmission with automatic clutch, and shaft drive keep the maintenance simple and easy. They're from name brand manufacturers. Simple and reliable running gear. We think those are all important traits in a good used ATV for a beginner. Simpler drivelines are easier to operate and maintain for a new rider than the more complicated 4x4 systems with locking differentials, etc. When shopping for used 4 wheelers, it's always a good idea to find a reliable dealer in your area for the brand you're considering. Driving long distances for service and repairs can get old in a hurry.